Challenges - Support Your Library Challenge, Once Upon a Time Challenge and Young Adults challenge. Published in 2008 by Doubleday. The snow came down so thickly that it formed fragile snowballs in the air, which rumbled and melted as soon as they landed on the horses lined up along the dock. It was four in the morning and the place was coming alive and Captain Samson had never seen the dock in such a bustle. The cargo was flying out of the ship, literally; the cranes strained in their efforts to get the bales out as quickly as possible. The ship stank of the disinfectant already, stand of the stuff. Every man that came on board was so drenched in it that it dribbled out of his boots. But that wasn't enough; some of them had squelched aboard with big heavy spray cans, which spat an acid-pink fog over everything. Poor Mau is returning to his home after training to become a man on Boy's Island. As he tries to travel home, a tsunami destroys his island and causes mass devastation. Everyone he has ever known has died and he is left on the island alone. Or so he thinks. When the tsunami hit the island, the huge wave stranded a schooner called the Sweet Judy on the island and only one life is left aboard, a young trouser man girl. The two of them are left on the island to make a future for themselves and try and rebuild the Nation that once was. Firstly if you are expecting to find Discworld hidden amongst the pages, then be prepared as you won't find it. 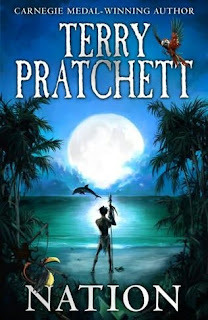 Pratchett described the setting as a parallel universe similar to the Pacific Ocean set in the 1800's. The book consists of bits of reality mixed in with a good dose of imagination. For the first few chapters of this book, I felt such a deep sadness. Poor Mau, was so young, yet he managed to send every last soul off to heaven by burying them at sea. He is worried that he hasn't become a man in the tradition of his kin, yet he does more than any man would ever have to in his lifetime and this one action of burying all the islanders he has known all his life, makes him a man. The book is about overcoming obstacles in order to make life more bearable. Daphne the trouser man girl and Mau manage to over come their language differences and learn to work together to make the island more hospitable to all the new arrivals who have lost their homes. The book also looks at the circle of life and shows how children grow and come to an age of reason and respect. I truly loved this book. The writing would lead me from tears to laughter as the book progresses and Daphne and Mau try to act as adults with and manage with grace and dignity. Both characters are so strong, that you forget they are actually children. They did remind me of Tiffany Aching from A Hat Full of Sky and Wintersmith, two books from Pratchett's Discworld series. This book has a little bit of everything within it. There is romance, there is courage and there are huge doses of humour, hidden amongst the pages too. There were times where I couldn't stop giggling to myself. It is a book that is beautifully written and needs to be read by all. It is sheer escapism which I couldn't get enough of. I found the first half of the book quite breathtaking, whilst Daphne and Mau are alone on the island, once more people arrived though I felt that something was lost between them and it was no longer their story anymore. I dearly loved both characters and would have loved the book to end differently. I am happy with the ending, but being quite a romantic I would have preferred it if it had ended a different way. PS. You will have to excuse my review of this book. I am not having the best of days and nearly didn't post, so I apologise if it is pants, but I can't really think straight today. Do you ever get those days when you are trying to review a book and it is just not happening, which for me is a shame, as this book is really beautiful. I feel like I am shortchanging you guys today, so apologies. Hope you feel better soon! Didn't think your review was pants at all, but I definitely know how you feel. I'm just now getting back into the swing of blogging after being ill/depressed for too long. Well, I didn't get the idea from you (for once), but I also have this one in my stack. I haven't read it yet and have only glanced over your review, but seeing that you loved it, I am now looking very much forward to read it myself. I know what you mean about almost not being able to write let alone think. I sometimes feel like that too, and more often than not, I just skip writing or save whatever I have already written for another day where the flow is better. I didn't notice that your review was bad or anything though. Not pants at all - please don't put yourself down like this. Not a huge fan of T.P. but his book Wintersmith is one of the most beautiful books I've ever read. Have you read it by any chance. Your review was just fine! Don't worry about that at all, and i hope you feel better soon. For some reason, Terry Pratchett scares me. I've even read one of his younger Discworld books, but I still haven't been able to read anything else by him yet. I really want to read this one though! Some books are harder to review than others, that is for sure, but I think your review is great. It makes me want to try Pratchett's work. I hope today's a better day for you. This was one of my top reads last year. Or the year before... I don't remember now, but I did adore it. Now, reading your review, it makes me think a little of The Graveyard Book, with Bod growing up and seeming like such a kind adult, too. 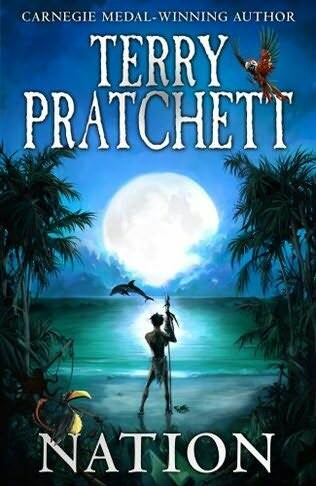 Anyway, still haven't read Pratchett but one day!